The "pi-hsieh" is a mythological creature commonly thought to be able to ward off evil forces with its magical powers. In fact, its name means "to ward off evil" in Chinese. In the Han dynasty, "pi-hsieh" were commonly represented as winged, four-legged beasts, a form that was probably transmitted from Western Asia. Often found as huge stone statues, they would be placed along the spirit road leading up to tombs. Some were also carved from quality jade and used as ornaments for the wealthy and powerful. 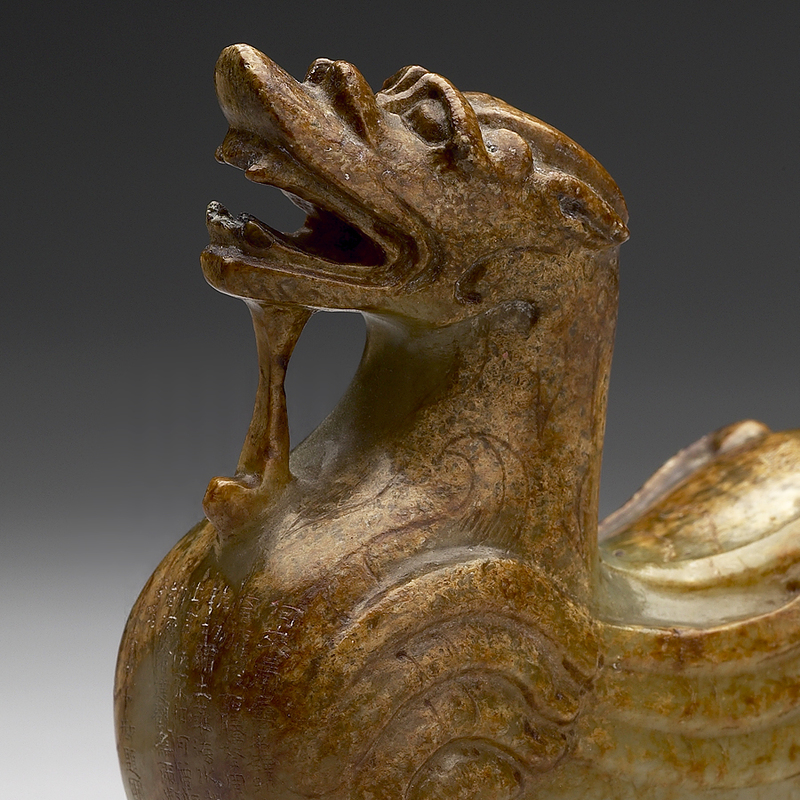 This example, originally carved from a piece of green jade, is represented with its head raised and jaws open as if the creature is emitting a low growl. Its stance alludes to the fact that it is walking forwards, and although the wings are pressed to its back, they give the impression that they will unfold and beat at any minute. The long beard of this spectacular creature sprouts from its lower jaw and extends all the way down to its chest, its tail brushes the ground behind it. Over the years, the color of the jade has changed to a mottled yellowish brown. This is one of the larger examples of Han dynasty jade "pi-hsieh" known. It is different from other jade carved "pi-hsieh" in that its snout is relatively long, resembling that of a horse, where others appear more like that of a tiger’s. Furthermore, it bears an uncanny resemblance to objects that scholars refer to as "dragon heads", adornments on bronze furnaces recently unearthed in Inner Mongolia and dating to the middle and late Han periods. This example in the collection of the National Palace Museum was once an important part of the imperial collection, and one of the emperor's poems is carved onto the chest. The Museum also has a two-tiered rosewood stand that accompanies this piece, the upper tier of which is carved with the words "Imperial curio for the Ch'ien-lung Emperor", and the lower tier carved with the same imperial poem found on the creature’s chest. These carved characters are also inlaid with silver.